No-deal Brexit plans could place Northern Ireland's agri-food industry at a "significant disadvantage", the UK's environment secretary has said. The UK plan would mean that food exports from the Republic to NI would face zero tariffs, said Michael Gove. However, goods going the other way from NI to the Republic could face high tariffs. Mr Gove said the impact would depend on what the Irish government and European Commission choose to do. He was addressing the Environment, Food and Rural Affairs Committee. Does NI tariffs plan violate WTO law? When the government announced its plan earlier this month, it acknowledged that Northern Ireland's businesses and farmers would have concerns about the impact on their competitiveness. It stated: "These are the only steps the UK government can unilaterally take to deliver on our absolute commitment to avoid a hard border in the event of no deal." The major challenge for Ireland in the event of no deal will concern the control of animals and food products. The EU has strict procedures on the importation of such products from non-member states. They must enter through border inspection posts which involves infrastructure of the sort the Irish government says it will never accept. 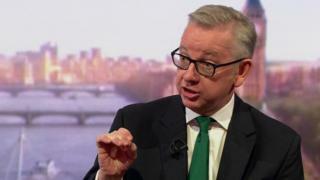 Mr Gove suggested that a way round this would be for food products from the island of Ireland to be checked as they arrive in continental Europe. He added that this was not a policy he was advocating. Meanwhile, Northern Ireland Secretary Karen Bradley clashed with MPs over the government's claim that Northern Ireland was not fully prepared for a no-deal Brexit because of the Stormont deadlock. The secretary of state was giving evidence to Westminster's NI Affairs Committee. On Monday, Theresa May told Parliament a no-deal Brexit would require some "direct application of powers" from Westminster to NI. Mrs Bradley said the Northern Ireland Office was ready to step in, but wanted the UK to leave the EU with a deal. She was pressured about the PM's claim by DUP MPs including Ian Paisley and the committee's chairman, Conservative MP Andrew Murrison. They argued that the government had not raised this possibility until recently, and questioned why preparations had not been made sooner. "We are prepared but we don't have ministers in place to take those steps," said tMrs Bradley. Mrs Bradley said that if a no-deal Brexit occurred, a process would need to take place, which could include direct rule ministers in London taking some decisions for Northern Ireland. Stormont's institutions have been deadlocked since January 2017, when the power-sharing parties split in a bitter row. She said the consequences of no-deal would be "acute and long lasting", but that the government was taking steps to mitigate the impact. She said in that scenario, the government would have to take steps with regard to obligations under the Good Friday Agreement, and consult with the Irish government about how decisions would be made for Northern Ireland. "It would be to deal with short term impacts of no deal... health, education, people can get to work ,that hospitals continue to function, so medicines are available as needed... that's the kind of things we'd be focusing on in that scenario," she added. Mrs Bradley said she "could sometimes weep" when she thought of what a no-deal Brexit would mean, that could be avoided if MPs backed the government's deal. But Mr Paisley, whose DUP colleagues have so far said they will not vote for it, said "not a jot and title" in the agreement had changed so far. The DUP has been seeking changes to the Irish border backstop.